Cairn Terriers originated from the Highlands of Scotland. In keeping with their roots, many owners select a name of Scottish origins. Duncan, Finley, Ross are popular Scottish male names. Female favorites include Kirstin, Maisie, and Sheona. Cairn Terriers have a history of hunting rats, foxes, and badgers that live among the rocks in the Highlands. In fact, the word ‘cairn’ refers to a man-made pile of stones. Plymouth, Ayer, Rosetta, and Blarney are few interesting name choices taken from famous rocks. 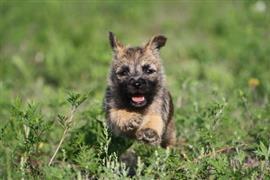 Another fun way to come up with a Cairn Terrier name is to look back to childhood Fairy Tales. Many of the recurring names in bedtime stories that are told to children convert nicely into a dog name. Probably among the most popular choices is Jack who traded his cow for magic beans. When Hansel and Gretel are not avoiding a child-eating witch, they are busy donating their names to new puppy owners. Cinderella, Goldilocks, and Rapunzel are few other interesting choices from the world of children’s tales. Some of our pages will contain a subcategory. A subcategory is a slightly more specific grouping than the main topic of the page. For a subcategory, we will include a separated table of names and corresponding descriptions. An example of a subcategory of Red Dog Names would be 'Dog Names Inspired by Red Wines'. If you have any subcategory ideas for the Cairn Terrier Names page, we would love to hear them. Use the form below to submit your ideas.